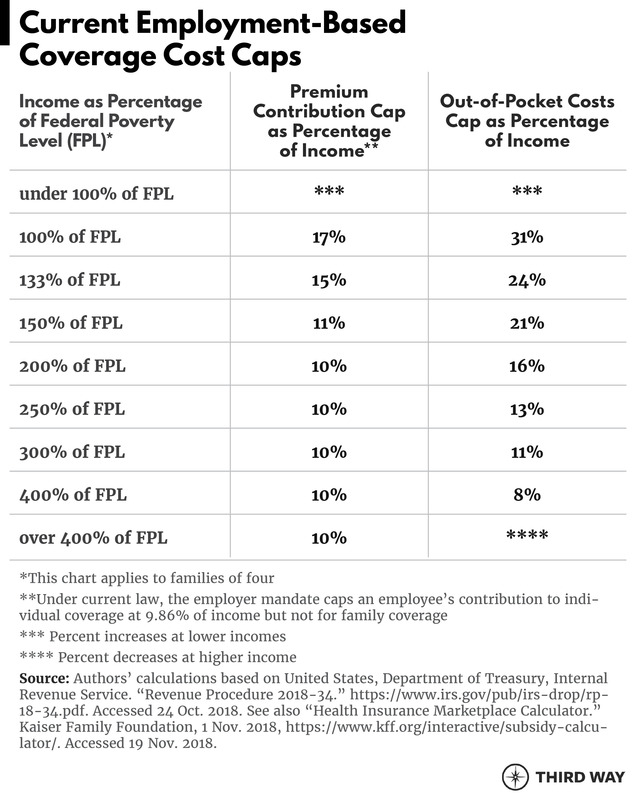 Cost Caps: Caps premiums, deductibles, and other out-of-pocket costs for everyone based on income. Universal Coverage: Ensures health care is a basic human right by automatically covering everyone not currently insured in an affordable plan. Cost Caps and Coverage for All would be paid for by protecting patients against high prices, realigning incentives to deliver better value for patients, reducing complexity for patients, and targeted tax increases on the wealthy. The United States can ensure that every single person in the country has stable health coverage and lower out-of-pocket costs—without disrupting anyone’s coverage through their employer, Medicare, Medicaid, or the exchanges. The Affordable Care Act (ACA) laid the foundation for this by protecting everyone with a pre-existing condition and expanding coverage. But rising health care costs still squeeze paychecks and drive up deductibles. Forty-one million people still struggle to pay health care bills due to coverage gaps. Twenty-nine million people still lack coverage altogether. We can boldly finish the job by reforming and expanding the ACA to ensure that coverage is universal and truly affordable for all. Our proposal preserves and improves the coverage that people already have through their employers, Medicare, Medicaid, and the Affordable Care Act. It includes a Medicare Early Start public plan option for those in the individual market between ages 55 and 64. It reduces out-of-pocket costs including surprise bills, bends the cost curve on national health care expenditures, and is affordable for taxpayers with a price tag at a fraction of what other universal health care proposals cost. It provides a unifying platform action that builds on Obamacare instead of starting from scratch while also borrowing ideas from progressives seeking an expansion of Medicare coverage. And it fulfills the promise of stable, secure, affordable health care for everyone. Everyone pays too much for health care as incentives push health care providers and manufacturers to drive up costs instead of driving up value. For an employee earning $15/hour, it would take 6 weeks of paychecks to cover a $3,000 deductible. A standard definition of underinsurance sets 10% as the maximum for out-of-pocket costs for most people and 5% for people with incomes under 200% of the poverty level.9 Deductibles over 5% of income are also considered underinsurance. Being underinsured is comparable to being uninsured. Forty-one percent of underinsured, non-elderly adults forgo medical care because of costs.10 That level is not too far from the 59% rate for those who lack insurance for part or all of a year. Forty-one percent of underinsured, non-elderly adults forgo medical care because of costs. The ACA forged a standard for affordability for premium contributions and for out-of-pocket costs. But the standard is inadequate and limited. Unaffordable premiums and underinsurance are problems found in every type of coverage to varying degrees. In Appendix A, we detail how the underinsured make up 44% of the exchanges, 24% of employer-based coverage, 24% of Medicare recipients, and 26% of Medicaid recipients. Strikingly, two out of every three uninsured Americans are actually eligible for free or discounted coverage—whether through Medicaid or a subsidy. But they may face other barriers to enrollment such as the complexity of enrollment or not realizing the importance of coverage to protect their health and finances. Two out of every three uninsured Americans are actually eligible for free or discounted coverage—but they may face other barriers to enrollment. Premium increases have swallowed every cent of the raises for 40% of employees with lower incomes who have no dependents on their health benefits. Many studies show a wide variation in costs within regions in the US.21 For example, Medicare spending in Austin, TX is 27% more than Portland, OR, after accounting for demographic, cost-of-living, and health differences.22 Employers also face a wide variation in the cost of health benefits for their employees. The cost for employment-based coverage in Houston is 30% more than New York City.23 This kind of analysis is why economists have concluded there’s a high level of waste in health care. The US spends, on average, much more per person on health care than any other developed nation and has worse performance across a wide variety of measures, including access to care and health outcomes. The root of both sources of waste is the fee-for-service payment system. Today, providers usually receive a fee for every service they provide whether or not it is needed, wanted, or successful. That system creates an incentive for providers to deliver too much care for services that are reimbursed on a piecemeal basis (like tests and office visits) and too few services that often are not reimbursed (like communication with patients and telehealth). Further, since patients don’t know what care they need, they and their employers have little leverage in negotiating a price that is fair for individual services. They would have a clearer view of their choices if providers charged a single price for bundles of services like for a knee replacement or for comprehensive care for a patient with a chronic disease like diabetes. Medicare is moving toward such new payments, but employers still lack leverage where providers and health plans don’t have competition. Other sources of waste are duplicate services and administrative overhead. Although providers have largely adopted electronic health records, they don’t regularly share that information to create a complete health record that can prevent duplication. One recent study found unnecessary duplicative tests in one-fifth of the digital records they examined.27 Similarly, the fragmented system for processing health care bills drives administrative costs. A single bill can involve up to four bank accounts. The accounts of the patient, the doctor, and the health plan are the core three. Add to that a flexible spending account, a health reimbursement account, a health savings account, or a wellness account that rewards healthy behaviors, which might all be available to a single person. While bills are usually processed electronically, they often involve entering the same data into a computer multiple times by doctors’ offices, patients, and health plans, which is unnecessary when the transfer of standard digital information is commonplace in most other sectors of the economy. 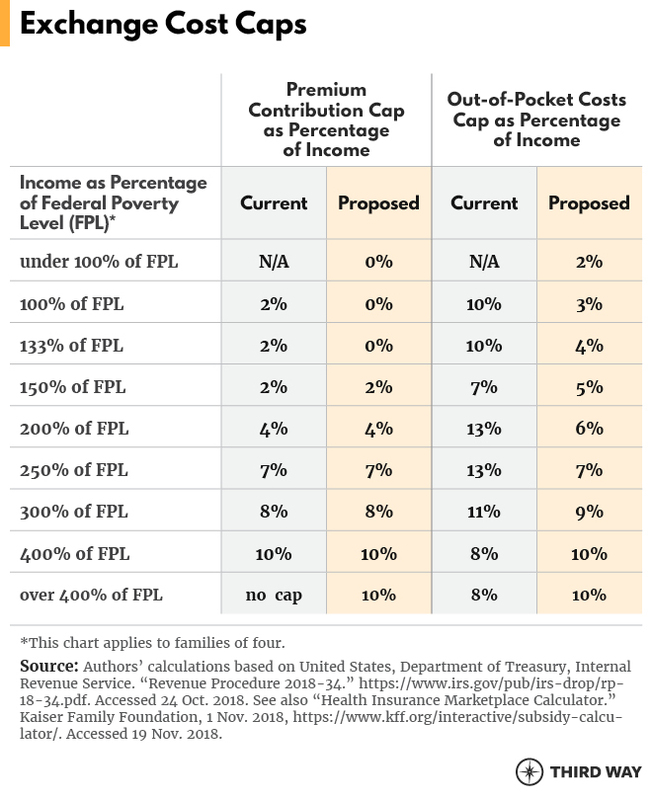 Cost Caps: It caps premiums, deductibles and other out-of-pocket costs for everyone based on income. Universal Coverage: It ensures health care is a basic right by automatically covering everyone not currently insured in an affordable plan. For those in the ACA exchanges: people with low-incomes will pay less in premiums, and those in the middle class will finally have premium protection. Out-of-pocket caps will be fairer across income levels. For those in employment-based coverage: out-of-pocket costs will be capped to make it more affordable for individuals, and employers will have options to adjust coverage they provide. For those in Medicaid: the current cap on premiums and out-of-pocket costs will be reduced for the most vulnerable. For those in Medicare: out-of-pocket caps will be added to help the middle class, and there will be an overall cap on drug costs. Cost Caps and Coverage for All will make health care universal, stable, and affordable for everyone without disrupting existing coverage through employers, Medicare, and Medicaid. It will limit how much they have to pay and guarantee universal coverage without disruption. Let’s start with the people who get their coverage on the ACA exchanges. In order to cap costs in the exchanges fairly across all income levels, Congress should reduce premium caps for people with low-incomes while adding caps to those in the middle class. It should also smooth out the out-of-pocket costs for all income levels. 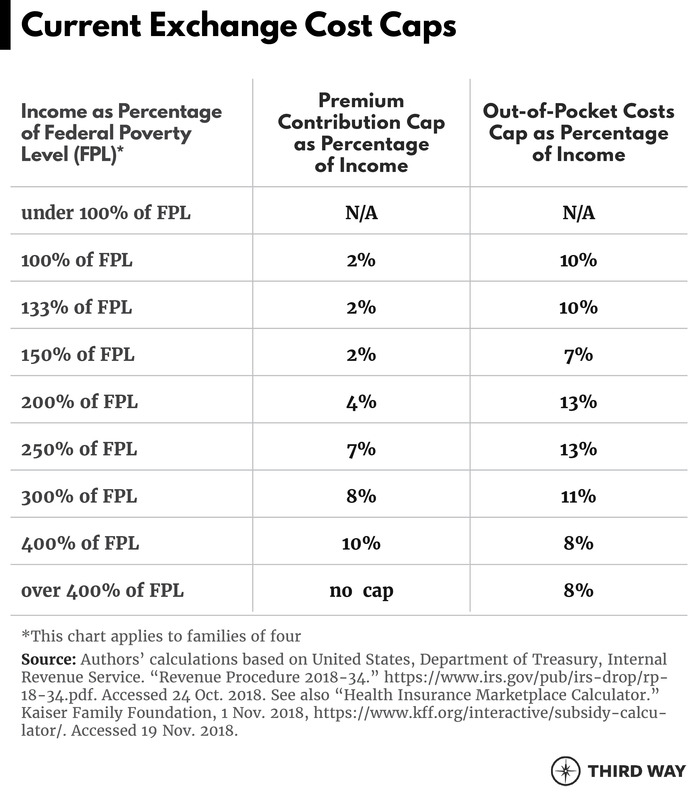 Technically, this means Congress should expand cost-sharing reductions to people with incomes from 200% to 400% of FPL as shown in the chart below. It should also extend premium support through subsidies for everyone at 400% of FPL and above, which would end an abrupt cut-off under current law known as the subsidy cliff. Adopt out-of-pocket caps voluntary. Employers could adapt their current health benefits to the caps shown below. For example, they could vary their deductibles by income as some employers already do while bearing the additional costs of doing so.32 Under this option and generally, the Cadillac plan tax cap, which imposes a 40% tax on health plans with rich benefits, would be repealed to give employers more flexibility to redesign their benefits to accommodate the caps. Use exchange subsidies. Employers could continue to offer the same benefits as today and use the exchange subsidies that today are available only to individuals under the ACA. In return for using the exchange subsidies, employers would agree to follow the Cost Caps and Coverage for All limits on employees’ health costs. This option could be particularly attractive to employers with lower-wage workers and smaller employers, although administrative costs might be higher. Employment-based plans could continue to self-insure or offer some or all of the health plan choices from the exchanges. If an employer did not choose either of those options, their employees would have the option to utilize the exchanges in order to get coverage with cost caps. This option would require changing current law that prevents employees from getting subsidized coverage through the exchanges if they can get affordable coverage through their employer. Employers could still provide premium assistance to unsubsidized employees under a new health reimbursement arrangement (HRA) regulation under consideration by the Administration.33 This new regulation would let employers offer employees the chance to choose the own coverage in the individual market with an employer contribution through an HRA. The employer mandate from the ACA would no longer be necessary because the protection it provides for workers would be superseded by the cost caps. To protect individuals on Medicaid, we should make Medicaid’s current cap on premiums and out-of-pocket costs consistent with the exchange caps. 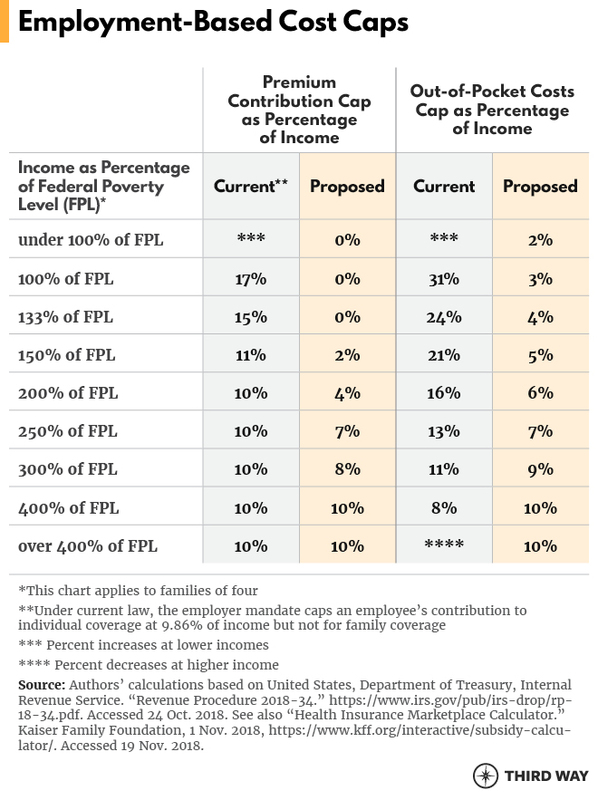 With this, the caps in Medicaid for adults under 150% of FPL would be lowered as shown in the chart below. States should also have flexibility in how they provide the extra out-of-pocket protection, including combining Medicaid coverage with exchange-based coverage for ease of administration. Finally, Medicare beneficiaries should also be protected with cost caps through improved supplemental coverage. Currently, most beneficiaries already have some form of supplemental coverage (including private supplemental coverage called Medigap, prescription drug coverage called Part D, Medicare Advantage private plans, or the Medicare Savings Program for low-income beneficiaries administered by Medicaid), which provide critical limits on out-of-pocket costs for most beneficiaries. But that supplemental coverage is inadequate to protect low-to-moderate income beneficiaries, and no one in Medicare is guaranteed protection from catastrophic drug costs. Medicare beneficiaries can have cost protection without disruption or further changes to their existing coverage. To better protect beneficiaries, out-of-pocket caps should be added to Medicare. The Medicare Savings program, which provides supplemental coverage for low-income individuals, should be expanded to help people all the way up to 400% of FPL using 100% federal funding through Medicaid. In addition, the same level of assistance should be available through Medicare Advantage plans similar to the cost-sharing reduction program in the exchanges. Lastly, to protect beneficiaries from catastrophic drug costs, Medicare Part D should have an overall cap on drug costs as proposed by the Administration along with additional measures to constrain drug prices as discussed below in Part #3.34 Medicare beneficiaries can have cost protection without disruption or further changes to their existing coverage. The result of these changes is summarized in the chart below. Part #2: Universal Coverage: Automatically cover everyone in an affordable plan. Automatic enrollment: 14.2 million people who qualify for free coverage but have not enrolled will be automatically enrolled in the best-valued health plan in their region. Automatic application: 10.3 million people who qualify for subsidized coverage but have not enrolled will receive an automatic, one-click application to activate coverage for the highest-valued plan in their region. Automatic backstop: Catastrophic-like coverage through a new program called Critical Care Backstop will be provided for those who remain unenrolled. Medicare-E Option: Those 55 to 64 years old currently in the individual exchange market will have the option to enroll in an expanded Medicare program. An estimated 14.2 million people who are eligible for free coverage would be automatically enrolled in the best-valued health plan in their region.35 They would receive multiple notices and have 60 days to opt-out or change plans. In 2017, 4.7 million uninsured people were eligible for free coverage through a health insurance exchange plan but not enrolled.36 Similarly, in states that have expanded Medicaid coverage, 7.3 million people are eligible for free coverage but not enrolled.37 And 2.3 million low-income Americans would be eligible for Medicaid if their state had expanded Medicaid.38 Cost Caps and Coverage for All would provide coverage through the exchanges and Medicaid. It would give states much stronger financial incentives to expand Medicaid as described in the question and answer section below. An estimated 14.2 million people who are eligible for free coverage would be automatically enrolled in the best-valued health plan in their region. This approach builds off Rep. Ami Bera’s (D-CA) bill to encourage states to use automatic enrollment and to give states the information available through federal agencies that is needed to determine eligibility for automatic enrollment.39 Designing and testing new enrollment procedures with consumers will be critical to making automatic coverage successful. For example, changing the open enrollment period from the end of the calendar year to a period that corresponds with filing income taxes could facilitate automatic enrollment based on the most recent income information. Auto-application would help a total of 10.3 million people who are uninsured but do not qualify for free coverage. In order to make auto-enrollment and auto-application fully functional, Congress will have to simplify the ACA eligibility rules and coverage verification systems. For example, to create certainty about the level of financial assistance individuals can receive, individuals should be able to use their previous year’s income (or current year income if less than the previous year) to qualify for assistance. 3.4 million uninsured who qualify for discounted coverage on the exchanges if they pay a portion of the monthly premium. Under the ACA, everyone in this group is already guaranteed to pay no more than 2.1% to 9.9% of their income on premiums. 3.8 million uninsured who qualify for discounted coverage through their employer but do not enroll. Many employers already provide coverage that costs employees less than 9.9% of their income through an automatic enrollment process. If they do not, then employers could choose to adopt an automatic enrollment process along with using the exchange subsidies as outlined above. Anyone who is not otherwise covered and chooses to opt-out of automatic coverage would have an automatic backstop through a new program called Critical Care Backstop. No one in America should have to worry about life-saving treatment because they couldn’t enroll in coverage or made a mistake by not enrolling. And health care providers shouldn’t have to worry about trying to collect payments from people without coverage. No one in America should have to worry about life-saving treatment because they couldn’t enroll in coverage or made a mistake by not enrolling. This would essentially function like catastrophic coverage. Critical Care Backstop would provide payment for things like emergencies and cancer treatment. Patient costs would be based on a sliding scale similar to the way community health centers work today. It would be financed through a tax assessment on anyone who doesn’t have coverage. While the individual mandate levied a financial penalty, people had to pay the penalty and got nothing in return. Under this plan, they would pay a fee—but then get coverage. Exemptions from the individual mandate penalty, such as not being able to afford the fee, would apply to this new fee. Critical Care Backstop would not require anyone to sign up for coverage because their bills would be paid regardless through Medicaid. It would apply to everyone without coverage irrespective of an individual’s legal residency status as long as they pay federal income taxes. Currently, legal immigrants qualify for coverage and subsidies through the exchanges, but not Medicaid. Cost Caps and Coverage for All would end that policy and also cover the 4 million people in America who are undocumented immigrants and uninsured through Critical Care Backstop. For those aged 55 to 64 who are currently participating in the exchanges, a variation of a public plan called Medicare-E (“E” for early start) would have the option using Medicare as a new source of coverage.43 Currently, a little over three million individuals aged 55 to 64 participate in the exchanges.44 This step would allow them to enroll in Medicare with the same level of subsidies and benefits they receive today through the exchanges. Replace expensive fee-for-service: Payments to providers will be based on value instead of wasteful fee-for-every-service, and drug manufacturers will be held accountable for the value of prescription drugs. Ban surprise bills: Out-of-network charges will be capped and patients will no longer receive surprise bills. Reduce complexity: A single health record will be provided to all individuals to reduce duplicative services and administrative costs. Federal budgetary savings from these measures would finance the coverage expansions while lowering projected health care spending as the ACA accomplished. Any remaining costs of the proposal not covered by the actions above would be paid for through targeted tax increases on the wealthy. Step 1. Replace expensive fee-for-service. Congress needs to replace expensive and wasteful fee-for-service payments with pay-for-value. Value-based payments, which make providers accountable for the quality and cost of care, are gaining traction and come in many shapes and sizes. Take, for example, a knee replacement under a bundled payment. Rather than getting nickel and dimed for everything from anesthesia and bandages to hospital food and physical therapy, health plans and patients pay one “bundled” payment that combines everything into one negotiated price. That gives all providers a strong incentive to work together to get patients back on their feet quickly. Another example of a value-based payment is for an accountable care organization (ACO), which covers all the medical care services that a patient receives. That gives surgeons an incentive to work with home health care aides so patients can successfully recover at home and not have to return to the hospital. Cost Caps and Coverage for All would focus health care delivery on the best value for patients instead of the highest price, putting patients before the health care industry. Under recent legislation, Congress positioned Medicare to lead the movement away from fee-for-service toward value-based care.46 It is time to make these types of value-based payments ubiquitous throughout the health care system, replacing fee-for-service with pay-for-value. Fee-for-service payments for out-of-network care in private plans should be capped at a fixed percentage over Medicare prices. The price cap would be phased-in over several years in order to allow time for providers to switch to pay-for-value. The phase-in would occur faster in areas where health care costs were the highest. Surprise billing should be banned using a similar method. Surprise bills occur when a patient receives care from an out-of-network provider at an in-network facility. Excessive out-of-network charges can come from providers whom the patient may not even interact with such as the anesthesiologist, pathologist, or radiologist. Congress should prohibit surprise bills for all services provided at in-network facilities by out-of-network providers and emergency department services. To ensure fair-market reimbursement, Congress should set a reimbursement benchmark such as a percentage of the Medicare reimbursement rate for the service or the health plan’s average in-network rate for that service. That way, any out-of-network provider who provides services as part of in-network care would receive payments at in-network rates. To reduce costs and make health care easier and simpler to use, people need a single record for health records and claim payments.50 In the past, most people had a health plan that covered nearly everything and one doctor who held much of their medical records. Today, most people need multiple online accounts to get access to their health care records and pay their health care bills. This complexity is inconvenient, frustrating, and wasteful. Consumers would be better served if they could have a single record— encrypted for security—that would consolidate all of their health care records and transactions. Like financial websites that tie together multiple bank accounts, a single record would bring together multiple types of health accounts into a single point of control for each person. It should also allow individuals to search and conduct transactions across multiple systems. For example, an employee paying for an out-of-pocket cost must typically deal with three or more separate systems: the provider’s billing office, a health plan’s claims office, a flexible spending account, and possibly a health reimbursement account or a health savings account. Nearly half of all employers offer multiple combinations of such accounts.51 While each type of account has its own important role, they all require processing the same basic information multiple times. All that processing time and labor adds up to higher administrative costs for everyone. Similarly, for patients’ medical records, each provider has their own online portal for accessing records and communicating with doctors online, a result of the push for electronic health care records under the Obama Administration. But because no provider has a complete copy of a patient’s electronic record, patients receive duplicative testing and providers miss opportunities to coordinate care, which is especially important for people with chronic conditions. Consolidation of records is starting to occur. For example, Apple has made it possible to download health records from multiples sources onto an iPhone. Some health plans have consolidated the processing of claims from providers and flexible spending account claims. But far more needs to be done to make health care simpler and easier for everyone. Under Cost Caps and Coverage for All, every individual would have a single record with secure personal identity protection that would consolidate all of their health care transactions—from payment methods (e.g. FSA, HRA) to health information (i.e. electronic medical records). Congress should authorize the Department of Health and Human Services (HHS) to develop a common format for a single record system through a bottom-up, multi-stakeholder process. HHS would then offer them to Medicare beneficiaries, other public health care programs, and as part of the essential benefits under the ACA. The common format would handle multiple accounts, but also provide a way for individuals to have all of their key transactions in one place just like smartphones bring together apps under a common platform and let users decide which ones to use. Together, these cost-saving measures add up to a virtuous cycle of lowering costs and ensuring coverage for everyone. The phase-in of expanded coverage and cost protections would extend over five years. Priority would be for individuals who opt into coverage followed by those who are automatically covered. The total spending for the coverage expansions and cost protections would be $2.8 trillion over 10 years starting in 2021.53 The spending would be largely offset by annually cutting 10% of the waste from the variation in health care spending that doesn’t benefit patients. The cuts would be spread out over nine years and would be the equivalent of reducing the projected growth rate for per capita Medicare spending by one-third and by one-quarter for employment-based coverage. The other offset would consist of targeted tax increases on the wealthy such as restoring the federal estate tax to 2009 levels and raising income tax rates in 35% tax bracket and higher ($200,00 for individuals, $400,000 for couples) by two percentage points. What about stabilizing coverage in the exchanges? Would Cost Caps and Coverage for All reduce racial and ethnic health care disparities? Yes, it would. The lack of coverage is the biggest demographic and economic barrier for the quality of health care that minorities receive.56 Through our proposal for universal coverage and a cap out-of-pocket costs by income, minority populations will no longer face financial barriers to get the care they need. In addition, it would pay providers based on patients’ outcomes through which disparities for racial, ethnic, and economic groups can be readily identified and reduced using payment incentives that reflect the goal of equitable health care. How does value-based care take into account people’s unique preferences? What happens to people who have high out-of-pocket costs year after year? While Cost Caps and Coverage for All provides a new level of protection for all individuals, there is room to go even further to help patients with chronic conditions who reach the cap year-after-year. One solution is called value-based insurance design which can lower out-of-pocket cost for people with chronic conditions.58 Another is first-dollar coverage for chronic disease treatment through health saving accounts, which help patients cover out-of-pocket costs in high deductible policies.59 Congress should enable both of those solutions and examine other possible solutions like multi-year deductibles. How will employers determine household income to implement cost caps by income level? Employers currently use an employee’s individual income, not family income, to determine whether they are offering coverage that costs less than 10% of the individual’s income (as required under the employer mandate). 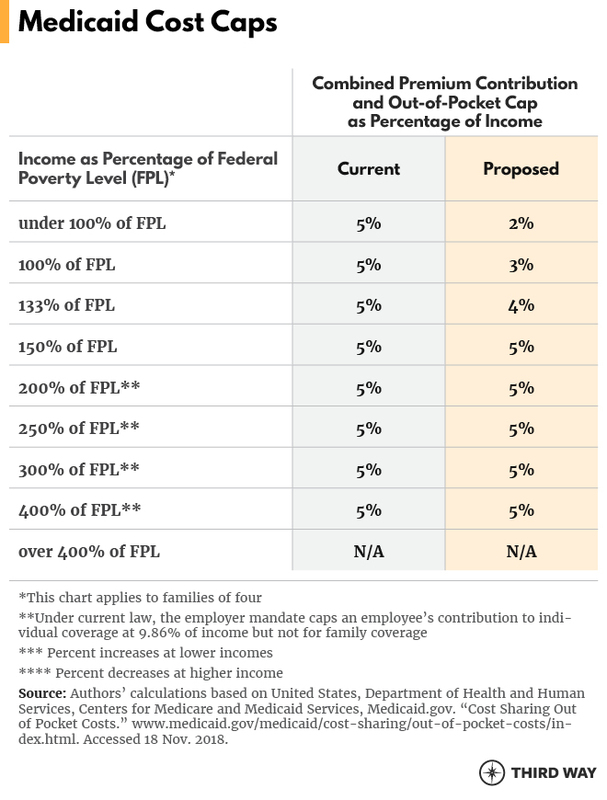 Under Cost Caps and Coverage for All, employees who need family coverage would have cost caps based on their family income. Employees should have the opportunity to report their family income to their health plan confidentially without employers knowing the amount. That way, they can be sure to get the right level of subsidies for their family and avoid having to pay back excessive subsidies, which would be reconciled as part of annual tax filings. What level of benefits would be the basis for the cost caps? 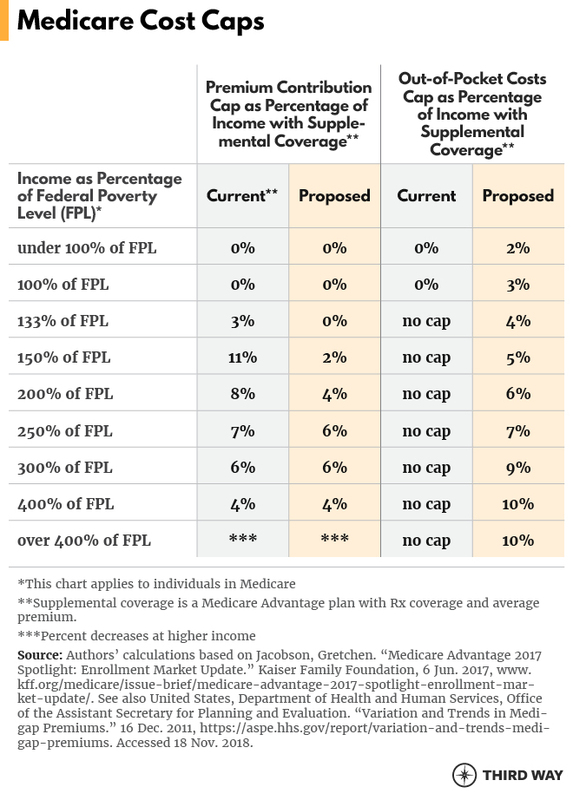 The cost caps would be based on the same level of benefits under the ACA. For example, the premium limits in the ACA are tied to the actuarial value of essential benefits and the second lowest-cost silver plan in an area. Would health reimbursement account contributions from employers count towards caps on out-of-pocket costs? Yes, they would. Health reimbursement accounts are an important way that employers offset the impact of high deductibles. An HRA contribution for an employee’s out-of-pocket costs can be as valuable to employees as the coverage itself. What benefits would Medicare-E cover? Medicare-E would cover all the essential benefits required under the ACA. And like traditional Medicare, Medicare-E would cover some of those benefits through supplemental coverage, like Medicare’s current prescription drug coverage. How would Medicare-E set its premiums? Medicare-E would set its premiums according its projected expenses for each year and its losses or gains in the previous year. Expenses would include the same health care taxes and fees paid by private plans. Its income and expenses would be accounted for separately in the federal budget. In Medicare-E, would providers be paid at current Medicare levels? No. Providers serving Medicare-E patients would be paid at the same rates set for the out-of-network limits, which would be set at a percentage higher than Medicare rates. Setting those rates will require consideration of many factors, including the prices that plans currently pay in-network providers and incentives for providers to participate in value-based care arrangements. Will the Critical Care Backstop program include EPSDT for children? Yes. The Early and Periodic Screening, Diagnostic and Treatment benefit ensures children get comprehensive care for all of their health needs. For children, coverage would be automatic and universal regardless of the status of a parent’s coverage. Adults under Critical Care Backstop would not receive coverage for preventive and primary care but would have it available on a sliding scale through community health centers. Would Critical Care Backstop discourage enrollment in Medicaid or the Exchanges? While some individuals may indeed choose not to enroll in any coverage and pay the tax assessment fee, the impact of Critical Care Backstop on coverage would be minimal for five reasons. First, Medicaid and subsidized exchange coverage will still cover most health care costs and will be a better deal for most people than Critical Care Backstop, which would cover fewer costs for about the same premium contribution. Second, anyone who had not paid any required fee would have to start paying it before receiving care in order to discourage free-riders. Third, the incentives for health plans and providers to encourage enrollment in Medicaid and exchanges from which they will have greater revenue would more than offset any incentive by a state to steer people to Critical Care Backstop, which would be cheaper for the state. Fourth, states would be required to automatically enroll eligible people in Medicaid and the exchanges (if they run their own exchange), which would make it difficult for a state to steer individuals to Critical Care Backstop. Fifth, Critical Care Backstop would be implemented after the automatic coverage and market stabilization measures are fully enacted in order to further minimize disruption. What about states that haven’t expanded Medicaid? Would Medicaid spending be cut due to cost saving initiatives? No. Although Medicaid would save money from reductions in cost variation and value-based health care, those savings would be used to increase Medicaid’s low provider payment rates. How would Cost Caps and Coverage for All be phased in? Automatic coverage should start with states that are prepared to implement it first with federal funding for the technology start-up costs. Initially, we estimate that 10 states could lead the way and help develop best practices. Within five years, automatic coverage would be implemented nationwide. The phase-in of the cost caps should occur as quickly as possible commensurate with cost savings, and priority should be given to helping individuals who are at the greatest financial risk today. Lastly, the phase-in of limits on fee-for-service payments under Medicare and for employment-based and individual coverage will be phased-in over nine years. The specific annual limits will depend on the development of value-based payments as Third Way has proposed previously.61 A renewed effort with a revised charter for the Center for Medicare and Medicaid Innovation would help support their rapid development. Congressional deadlines for achieving savings will also be critical. Although the exchanges have made premiums affordable for most people in them, they do not provide adequate protection from out-of-pocket costs, which leaves 42% of non-elderly adults financially vulnerable.62 The existing protections are uneven across income levels. Thanks to a program called cost-sharing reduction (CSR), a family of four with an income $50,000 per year, which is just under 200% of FPL, has a limit on their potential out-of-pocket costs as high of 7% of their income in 2019 (without the CSR program, the financial risk for that family would be 16% of their income).63 But with a slightly higher income of $53,000, that same family would have to face out-of-pocket costs of 13% of their income. The chart below shows an evenly increasing cap on premiums by income today except at incomes of 400% or higher. The cap on out-of-pocket costs is high and uneven at most income levels. Only at 400% and above does the out-of-pocket cost cap adequately protect people from excessive financial risk. For the one-quarter of employees who are underinsured, the financial risks are particularly severe for low-income workers.65 One-fifth of employees face a $6,000 maximum for out-of-pocket costs.66 For a $15/hour earner, that is 20% of their income. The ACA has a premium contribution cap for employees as part of the employer mandate, which applies to firms with 50 or more employees. The cap is just under 10% for a premium contribution to individual coverage. The cap is for coverage that covers 70% of an employee’s out-of-pocket costs. That leaves $7,900 of potential out-of-pocket costs in 2019 for employees at all income levels. Thus, lower-wage workers have a much greater financial risk as a percentage of their income as shown in the chart below. Another problem called “the family glitch” stems from the fact that the 10% premium contribution cap does not apply to employees who need family coverage. As a result, employees with family coverage can be required to contribute much more than 10% of their income as shown in the chart. Even with Medicare’s near-universal coverage for older Americans, one in four Medicare beneficiaries are underinsured according to another Commonwealth Fund analysis, which uses somewhat different criteria for being underinsured.67 One-third of Medicare beneficiaries with incomes under 200% of FPL are underinsured because their costs for premiums and out-of-pocket costs exceed 20% of their income. The lack of adequate cost protection for Medicare beneficiaries is due to two factors: 1) gaps in supplemental coverage; 2) inadequate support for supplemental coverage for low to moderate-income beneficiaries. Medicare without supplemental coverage pays for 73% of beneficiaries’ health care costs (compared to 83-85% for typical employer plans in 2007).68 Most beneficiaries have some source of supplement coverage, which could be a Medigap plan, a Medicare Advantage plan, a prescription drug plan, a low-income supplement known as Medicare Savings Programs, or various combinations. The prescription drug plan has the biggest gap in coverage because it does not fully protect patients against very high drug costs.69 The Medicare Savings Programs, which are run by state Medicaid programs, are inadequate because they go up to only 135% of FPL, eligibility criteria vary by state, and enrollment rates are half or lower.70 The slightly more generous Low-Income Subsidy program for prescription drug phases out at 150% of FPL. 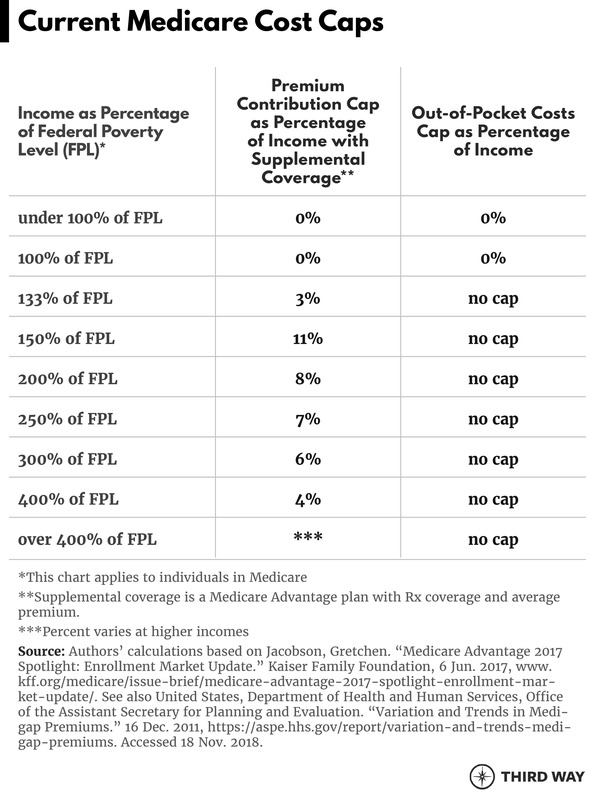 As the chart below shows, the premiums being paid by Medicare beneficiaries between 100% and 250% of FPL are a significant financial burden and nearly all beneficiaries face unlimited financial risk from very expensive drugs. 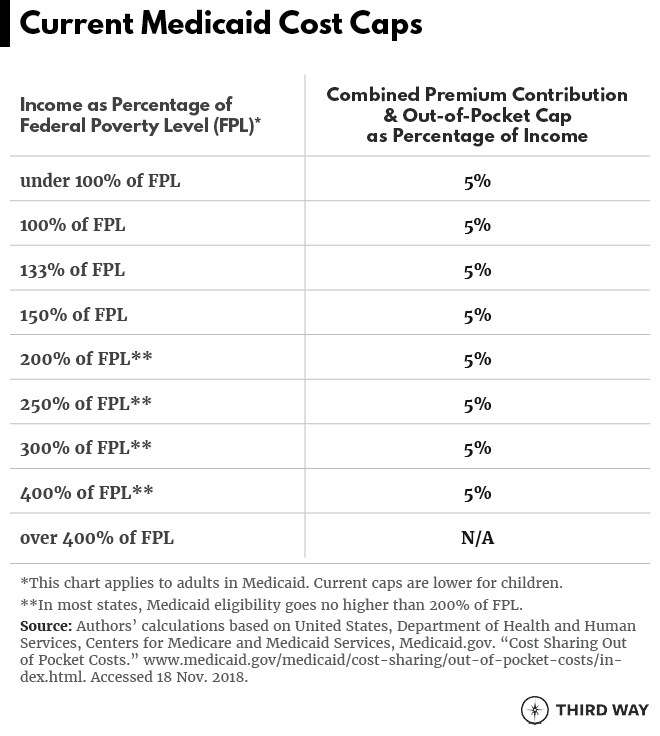 In contrast to older Americans in Medicare, the lowest-income Medicaid beneficiaries face costs that are out-of-line with their income level as shown in the chart below. United States, Congress, Congressional Budget Office. “Budgetary and Economic Effects of Repealing the Affordable Care Act.” Report, 19 June 2015, p 9, http://www.cbo.gov/publication/50252. See also Kendall, David and Jacqueline Garry Lambert. “GOP’s Waterloo? 10 Consequences from Repealing the ACA.” Report, 10 Jan. 2017, www.thirdway.org/report/gops-waterloo-10-consequences-from-repealing-the-aca. Accessed 20 Sept. 2018. Authors’ calculations based on United States, Department of Health and Human Services, Centers for Medicare and Medicaid Services. National Health Expenditure Data, Historical, NHE Tables, “Table 1: National Health Expenditures; Aggregate and Per Capita Amounts, Annual Percent Change and Percent Distribution: Selected Calendar Years 1960-2016.” www.cms.gov/Research-Statistics-Data-and-Systems/Statistics-Trends-and-Reports/NationalHealthExpendData/NationalHealthAccountsHistorical.html. Accessed 10 Aug. 2018. United States, Department of Health and Human Services. “Health Insurance Rights and Protections.” www.healthcare.gov/health-care-law-protections/rights-and-protections/. Accessed 20 Sept. 2018. Collins, Sara R., Herman K. Bhupal, and Michelle M. Doty. “Health Insurance Coverage Eight Years After the ACA.” Commonwealth Fund, 7 Feb. 2019, www.commonwealthfund.org/publications/issue-briefs/2019/feb/health-insurance-coverage-eight-years-after-aca. Accessed 7 Feb. 2019. United States, Department of Commerce, Census Bureau, Edward R. Berchick, Emily Hood, and Jessica C. Barnett. “Health Insurance Coverage in the United States: 2017, Sep. 2018, www.census.gov/library/publications/2018/demo/p60-264.html. Accessed 2 Nov. 2018. Claxton, Gary et al. “Employer Health Benefits: 2018 Annual Survey.” Kaiser Family Foundation, 2018, p. 111, www.kff.org/health-costs/report/2018-employer-health-benefits-survey/. Accessed 24 Oct. 2018. Authors’ calculations based on Claxton, Gary et al. “Employer Health Benefits: 2018 Annual Survey.” Kaiser Family Foundation, 2018, p. 111, www.kff.org/health-costs/report/2018-employer-health-benefits-survey/. Accessed 24 Oct. 2018. United States, Department of Commerce, Census Bureau. “Health Insurance Coverage in the United States: 2017.” 12 Sep. 2018, www.census.gov/library/publications/2018/demo/p60-264.html. Accessed 24 Sep. 2018; See also authors’ calculation based on Garfield, Rachel et al., “Estimates of Eligibility for ACA Coverage among the Uninsured in 2016,” Kaiser Family Foundation, 19 June 2018, www.kff.org/uninsured/issue-brief/estimates-of-eligibility-for-aca-coverage-among-the-uninsured-in-2016/. Accessed 14 Aug. 2018. See also authors’ calculations based on Rae, Matthew, Larry Levitt, and Ashley Semanskee. “How Many of the Uninsured Can Purchase a Marketplace Plan for Less than Their Shared Responsibility Penalty?” Kaiser Family Foundation, 9 Nov. 2017, www.kff.org/health-reform/issue-brief/how-many-of-the-uninsured-can-purchase-a-marketplace-plan-for-less-than-their-shared-responsibility-penalty/. Accessed 14 Aug. 2018. 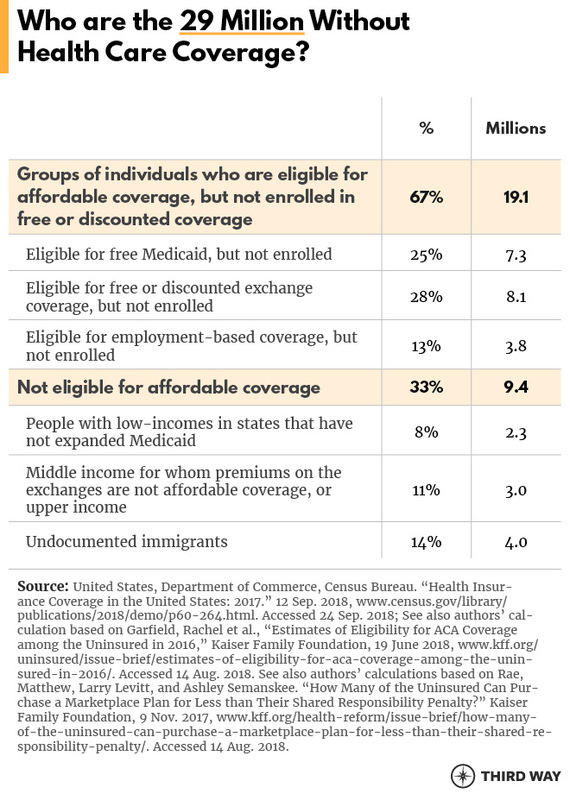 “Health Coverage of Immigrants.” Kaiser Family Foundation, 13 Dec. 2017, www.kff.org/disparities-policy/fact-sheet/health-coverage-of-immigrants/. Accessed 14 Aug. 2018. “2006 Kaiser/Hewitt Retiree Health Benefits.” Survey Chartpack, Chart 2, Kaiser Family Foundation, 30 Nov. 2006, www.kff.org/health-costs/report/2006-kaiserhewitt-retiree-health-benefits-survey/. Accessed 14 Aug. 2018. See also Scheiber, Sylvester J. and Steven A. Nyce. “Health Care USA: A Cancer on the American Dream.” Council for Affordable Health Coverage and Willis Towers Watson, Sep. 2018, www.cahc.net/newsroom/2018/9/4/new-report-shows-the-harmful-effect-rising-health-care-costs-have-on-wage-stagnation. Accessed 24 Sep. 2018. See also Minarik, Joe. “Healthcare Costs, Wage Growth, and Inequality.” Committee for Economic Development, https://www.ced.org/blog/entry/healthcare-costs-wage-growth-and-inequality. Accessed 24 Sep. 2018. Scheiber, Sylvester J. and Steven A. Nyce. “Health Care USA: A Cancer on the American Dream.” Council for Affordable Health Coverage and Willis Towers Watson, Sep. 2018, www.cahc.net/newsroom/2018/9/4/new-report-shows-the-harmful-effect-rising-health-care-costs-have-on-wage-stagnation. Accessed 24 Sep. 2018. Scheider, Eric C. et al. “Mirror, Mirror 2017: International Comparison Reflects Flaws and Opportunities for Better U.S. Health Care.” Commonwealth Fund, 14 July 2017, www.commonwealthfund.org/publications/fund-reports/2017/jul/mirror-mirror-2017-international-comparison-reflects-flaws-and. Accessed 24 Sep. 2018. Institute of Medicine. Variation in Health Care Spending: Target Decision Making, Not Geography. The National Academies Press, 2013, www.nap.edu/catalog/18393/variation-in-health-care-spending-target-decision-making-not-geography. See also United States, Congress, Medicare Payment Advisory Commission. “Regional Variation in Medicare Part A, Part B, and Part D Spending and Service.” Report to the Congress, Sep. 2017, www.medpac.gov/docs/default-source/reports/sept17_regionalvariation_report_final_sec.pdf?sfvrsn=0. Accessed 14 Aug. 2018. Unadjusted per capita spending means demographic differences not calculated. Authors’ calculations based on “Health Expenditure and Financing, 2014.” Organisation for Economic Co-operation and Development, https://stats.oecd.org/Index.aspx?DataSetCode=SHA. Accessed 14 Aug. 2018. See also “Health Care Expenditures per Capita by State of Residence, 2014.” Kaiser Family Foundation, www.kff.org/other/state-indicator/health-spending-per-capita/?currentTimeframe=0&sortModel=%7B%22colId%22:%22Health%20Spending%20per%20Capita%22,%22sort%22:%22desc%22%7D. Accessed 14 Aug. 2018. Authors’ calculations based on Newhouse, Joseph P. et al. “Variation in Health Care Spending: Target Decision Making, Not Geography.” The National Academies of Science, Engineering, and Medicine, 2013, www.nap.edu/catalog/18393/variation-in-health-care-spending-target-decision-making-not-geography. Accessed 14 Aug. 2018. United States, Congress, Medicare Payment Advisory Commission. “Regional Variation in Medicare Part A, Part B, and Part D Spending and Service.” Report to the Congress, Sep. 2017, www.medpac.gov/docs/default-source/reports/sept17_regionalvariation_report_final_sec.pdf?sfvrsn=0. Accessed 14 Aug. 2018. Authors’ calculations based on Newhouse, Joseph P. et al. “Variation in Health Care Spending: Target Decision Making, Not Geography.” The National Academies of Science, Engineering, and Medicine, 2013, www.nap.edu/catalog/18393/variation-in-health-care-spending-target-decision-making-not-geography. Accessed 14 Aug. 2018. See also Cooper, Zack et al. “The Price Ain’t Right? Hospital Prices and Health Spending on the Privately Insured.” Health Care Pricing Project, p. 54, www.healthcarepricingproject.org/papers/paper-1. Accessed 14 Aug. 2018. See also Quealy, Kevin and Margot Sanger-Katz. “The Experts Were Wrong About the Best Places for Better and Cheaper Health Care.” The New York Times, 15 Dec. 2015. www.nytimes.com/interactive/2015/12/15/upshot/the-best-places-for-better-cheaper-health-care-arent-what-experts-thought.html. Accessed 14 Aug. 2018.
Cooper, Zack et al. “The Price Ain’t Right? Hospital Prices and Health Spending on the Privately Insured.” Health Care Pricing Project, p. 3, www.healthcarepricingproject.org/papers/paper-1. Accessed 14 Aug. 2018. Gottlieb, Daniel J. et al. “Prices Don’t Drive Regional Medicare Spending Variations.” Health Affairs, Mar. 2010, www.healthaffairs.org/doi/10.1377/hlthaff.2009.0609. Accessed 14 Aug. 2018.
Cooper, Zack et al. “The Price Ain’t Right? Hospital Prices and Health Spending on the Privately Insured.” Health Care Pricing Project, p. 1, www.healthcarepricingproject.org/papers/paper-1. Accessed 14 Aug. 2018. Stewart, Bridget et al. “A Preliminary Look at Duplicate Testing Associated with Lack of Electronic Health Record Interoperability for Transferred Patient.” Journal of the American Medical Informatics Association, 1 May 2010, https://academic.oup.com/jamia/article/17/3/341/742401. Accessed 30 Oct. 2018. United States, Department of Health and Human Services, Centers for Medicare and Medicaid Services. National Health Expenditure Data, Projected, NHE Projections, Table 1: National Health Expenditures and Selected Economic Indicators, Levels and Annual Percent Change: Calendar Years 2010-2026: Selected Calendar Years 2010-2026, www.cms.gov/Research-Statistics-Data-and-Systems/Statistics-Trends-and-Reports/NationalHealthExpendData/NationalHealthAccountsProjected.html. Accessed 10 Aug. 2018. “Health Insurance Coverage of the Total Population: 2017.” State Health Facts, Kaiser Family Foundation, https://www.kff.org/other/state-indicator/total-population/. Accessed 6 Feb. 2019. See also Brenan, Megan. “U.S. Healthcare Quality Ratings Among Lowest Since '12.” Gallup, 30 Nov. 2017, https://news.gallup.com/poll/222992/personal-national-healthcare-quality-high-marks.aspx. Accessed 28 Nov. 2018; See also “The Value of Employer-Provided Coverage,” America’s Health Insurance Plans, Feb. 2018, www.ahip.org/esi-survey/. Accessed 28 Nov. 2018. Sammer, Joanne. “Tying Health Plan Premiums to Salary Can Aid Lower-Paid Earners.” Society for Human Resource Management, 19 Oct. 2017, https://www.shrm.org/resourcesandtools/hr-topics/benefits/pages/salary-based-health-plan-premiums.aspx. Accessed 20 Dec. 2018. United States, Department of Treasury, Internal Revenue Service. “Notice 2018-88, HRAs.” 19 Nov. 2018, https://content.govdelivery.com/accounts/USIRS/bulletins/21c91eb. Accessed 28 Nov. 2018. Cubanski, Juliette. “What’s in the Administration’s 5-Part Plan for Medicare Part D and What Would it Mean for Beneficiaries and Program Savings?” Kaiser Family Foundation, June 2018. Accessed 19 Nov. 2018. Author’s calculation based on Garfield, Rachel et al., “Estimates of Eligibility for ACA Coverage among the Uninsured in 2016,” Kaiser Family Foundation, 19 June 2018, https://www.kff.org/uninsured/issue-brief/estimates-of-eligibility-for-aca-coverage-among-the-uninsured-in-2016/. Accessed 14 Aug. 2018. See also Rae, Matthew, Larry Levitt, and Ashley Semanskee “How Many of the Uninsured Can Purchase a Marketplace Plan for Less Than Their Shared Responsibility Penalty?” Kaiser Family Foundation, 9 Nov. 2017, https://www.kff.org/health-reform/issue-brief/how-many-of-the-uninsured-can-purchase-a-marketplace-plan-for-less-than-their-shared-responsibility-penalty/. Accessed 14 Aug. 2018. Authors’ calculations based on Rae, Matthew, Larry Levitt, and Ashley Semanskee “How Many of the Uninsured Can Purchase a Marketplace Plan for Less than Their Shared Responsibility Penalty?” Kaiser Family Foundation, 9 Nov. 2017, https://www.kff.org/health-reform/issue-brief/how-many-of-the-uninsured-can-purchase-a-marketplace-plan-for-less-than-their-shared-responsibility-penalty/. Accessed 14 Aug. 2018. Rachel et al., “Estimates of Eligibility for ACA Coverage among the Uninsured in 2016,” Kaiser Family Foundation, 19 June 2018, https://www.kff.org/uninsured/issue-brief/estimates-of-eligibility-for-aca-coverage-among-the-uninsured-in-2016/. Accessed 14 Aug. 2018. United States, Congress, House. Pathway to Universal Coverage Act of 2018. Congress.gov, www.congress.gov/bill/115th-congress/house-bill/5624. 115th Congress, 2nd session, House Resolution 5624, introduced 3 May 2018. Accessed 14 Aug. 2018. For a discussion of auto-enrollment in the highest-value plan, see Kendall, David and Elizabeth Quill. “Rethinking Medicare Enrollment: Make High-Value Health Coverage the Easy Choice.” Third Way, 19 Aug. 2015, https://www.thirdway.org/report/rethinking-medicare-enrollment-make-high-value-health-coverage-the-easy-choice. Accessed 28 Nov. 2018. United States, Congress, House. Undo Sabotage and Expand Affordability of Health Insurance Act of 2018. Congress.gov, www.congress.gov/bill/115th-congress/house-bill/5155. 115th Congress, 2nd session, House Resolution 5155, introduced 5 Mar. 2018.Accessed 14 Aug. 2018. Medicare Part E—Early Start is different from a proposal by Anderson, Gerard F. and Hugh R. Waters. “Medicare Part E(veryone).” Brookings, 1 Jul. 2007, www.brookings.edu/research/achieving-universal-coverage-through-medicare-part-everyone/. Another proposal to expand Medicare for 55 to 64-year olds is by Bodenheimer, Thomas “A New Plan to Rescue the ACA: Medicare-At-55.” Blog, Health Affairs, 16 Oct. 2017: https://www.healthaffairs.org/do/10.1377/hblog20171022.860990/full/; See also Marans, Daniel. “Senate Democrats Introduce Bill Allowing Medicare Buy-In At 55,” Huffington Post, 4 Aug. 2017. https://www.huffingtonpost.com/entry/democrats-medicare-expansion_us_598491c6e4b041356ebf7569. Accessed 14 Aug. 2018. See also United States, Congress, Senate. Medicare at 55 Act. Congress.gov, https://www.congress.gov/bill/115th-congress/senate-bill/1742. 115th Congress, 1st session, House Resolution 5155, introduced 5 Mar. 2018. Accessed 14 Aug. 2018. United States, Department of Health and Human Services, Office of the Assistant Secretary for Planning and Evaluation. “Health Insurance Marketplaces 2016 Open Enrollment Period: Final Enrollment Report.” 11 Mar. 2016, www.aspe.hhs.gov/pdf-report/health-insurance-marketplaces-2016-open-enrollment-period-final-enrollment-report. Accessed 14 Aug. 2018. Avalere Health. “Medicare Savings-Diabetes Prevention.” Third Way, 16 Dec. 2014, https://www.thirdway.org/report/medicare-savings-diabetes-prevention. Accessed 14 Aug. 2018. Under the ACA and subsequently under the Medicare Access and CHIP Reauthorization Act of 2015. Kendall, David and Jacqueline Garry Lampert. “Bundled Payments: A Stable Foundation for Medicare Financing.” Third Way, 16 Dec. 2015, https://www.thirdway.org/report/bundled-payments-a-stable-foundation-for-medicare-financing. Accessed 28 Nov. 2018. Regulatory barriers can be eliminated by modernizing (but not eliminating) the Anti-Kickback Statute, the Stark Law (which prevents physician self-referral), the Medicaid best-price rule for prescription drugs, and FDA communication rules. See also Lambert, Jacqueline Garry and David Kendall. “Clearing a Regulatory Path for Value-Based Health Care.” Third Way, 23 Mar. 2018, https://www.thirdway.org/report/clearing-a-regulatory-path-for-value-based-health-care. Accessed 28 Nov. 2018. Kendall, David. “To Fight High Drug Prices, You Have to Be Focused.” Third Way, 26 Oct. 2018, www.thirdway.org/blog/to-fight-high-drug-prices-you-have-to-be-focused. Accessed 26. Oct. 2018. Mitchell, Billy. “White House Hosts Developers Conference on Blue Button 2.0.” FedScoop, 13 Aug. 2018, www.fedscoop.com/white-house-hosts-developers-conference-blue-button-2-0/. See also Kendall, David and Elizabeth Quill. “A Lifetime Electronic Health Record for Every American.” Third Way, 28 May 2018, https://www.thirdway.org/report/a-lifetime-electronic-health-record-for-every-american. Accessed 28 Nov. 2018. “FSA, HSA & HRA Report: Trends & Predictions.” Flexible Benefit Service Corporation, June 2015, p. 5, www.flexiblebenefit.com/sites/default/files/Flex-FSA-HSA-HRA-Report-Trends-Predictions.pdf. Accessed 28 Nov. 2018. Zafar, S. Yousuf. “Financial Toxicity of Cancer Care: It’s Time to Intervene.” Journal of the National Cancer Institute, Volume 108, Issue 5, 1 May 2016, https://academic.oup.com/jnci/article/108/5/djv370/2412415. Accessed 14 Aug. 2018. Authors’ calculations based on United States, Congress, Congressional Budget Office. “Federal Subsidies for Health Insurance Coverage for People Under Age 65: 2018 to 2028.” Report, 23 May 2018, www.cbo.gov/publication/53826. Accessed 28 Nov. 2018. See also United States, Congress, Congressional Budget Office. “Details about Baseline Projections for Selected Programs.” Apr. 2018, www.cbo.gov/about/products/baseline-projections-selected-programs#10. Accessed 28 Nov. 2018. See also United States, Congress, Congressional Budget Office. “Options for Reducing the Deficit: 2019 to 2028.” Report, 13 Dec. 2018, www.cbo.gov/publication/54667. See also Newhouse, Joseph P. et al. “Variation in Health Care Spending: Target Decision Making, Not Geography.” The National Academies of Science, Engineering, and Medicine, 2013, www.nap.edu/catalog/18393/variation-in-health-care-spending-target-decision-making-not-geography. Accessed 14 Aug. 2018. Authors’ calculations based on United States, Department of Health and Human Services, Centers for Medicare and Medicaid Services. “National Health Expenditure Data.” www.cms.gov/Research-Statistics-Data-and-Systems/Statistics-Trends-and-Reports/NationalHealthExpendData/index.html. Accessed 14 Aug. 2018. Schwab, Rachel, Emily Curran, and Sabrina Corlette. “Assessing the Effectiveness of State-Based Reinsurance: Case Studies of Three States’ Efforts to Bolster Their Individual Markets.” Center on Health Insurance Reforms, Georgetown University, Nov. 2018, http://chirblog.org/new-georgetown-report-assessing-effectiveness-state-based-reinsurance/. Accessed 28 Nov. 2018. United States, Department of Health and Human Services. “HHS Action Plan to Reduce Racial and Ethnic Health Disparities.” Nov. 2015, https://aspe.hhs.gov/basic-report/hhs-action-plan-reduce-racial-and-ethnic-health-disparities-implementation-progress-report-2011-2014. Accessed 18 Nov. 2018. Kendall, David and Elizabeth Quill. “Medical Discussion Guides: Less Confusion, Better Decisions for Patients.” Third Way, 5 Mar. 2015, https://www.thirdway.org/report/medical-discussion-guides-less-confusion-better-decisions-for-patients. Accessed 21 Jan. 2019. Beaton, Thomas. “How to Improve Cost Sharing to Enhance Chronic Disease Management.” HealthPayer Intelligence, 31 Jul. 2018, https://healthpayerintelligence.com/news/how-to-improve-cost-sharing-to-enhance-chronic-disease-management. Accessed 28 Nov. 2018. United States, Congress, Senate. The Chronic Disease Management Act. Congress.gov, www.congress.gov/bill/115th-congress/senate-bill/2410. 115th Congress, 2nd session, Senate Resolution 2410. Lambrew, Jeanne and Jen Mishory. “Closing the Medicaid Coverage Gap.” The Century Foundation, 31 Jul. 2018, https://tcf.org/content/report/closing-medicaid-coverage-gap/. Accessed 17 Jan. 2019. Authors’ calculations based on United States, Department of Treasury, Internal Revenue Service. “Revenue Procedure 2018-34.” https://www.irs.gov/pub/irs-drop/rp-18-34.pdf. Accessed 24 Oct. 2018. See also “Health Insurance Marketplace Calculator.” Kaiser Family Foundation, 1 Nov. 2018, https://www.kff.org/interactive/subsidy-calculator/. Accessed 19 Nov. 2018. Authors’ calculations based on “Health Insurance Marketplace Calculator.” Kaiser Family Foundation, 1 Nov. 2018, https://www.kff.org/interactive/subsidy-calculator/. Accessed 19 Nov. 2018. This analysis of underinsurance is different from the measures of underinsurance for the exchanges, Medicaid, and employment-based coverage in three key respects: 1) it does not include beneficiaries whose deductible exceeds 5% of income; 2) it does not include the segment of low-income beneficiaries whose out-of-pocket costs are between 5% and 10% of income; 3) it does include out-of-pocket costs for long term, dental, and vision care. Schoen, Cathy, Karen Davis, and Amber Willink. “Medicare Beneficiaries’ High Out-of-Pocket Costs: Cost Burdens by Income and Health Status.” Commonwealth Fund, May 2017, https://www.commonwealthfund.org/publications/issue-briefs/2017/may/medicare-beneficiaries-high-out-pocket-costs-cost-burdens-income. Accessed 12 Nov. 2018. McArdle, Frank et al. “How Does the Benefit Value of Medicare Compare to the Benefit Value of Typical Large Employer Plans? A 2012 Update.” Kaiser Family Foundation, Apr. 2012, p. 12, www.kff.org/health-reform/issue-brief/how-does-the-benefit-value-of-medicare/. Accessed 18 Nov. 2018. Trish, Erin, Jianhui Xu, and Geoffrey Joyce. “No Limit: Medicare Part D Enrollees Exposed to High Out-of-Pocket Drug Costs without a Hard Cap on Spending.” Health Affairs, Jul. 2018, https://www.healthaffairs.org/doi/10.1377/hlthaff.2018.0006. Accessed 18 Nov. 2018; See also Cubanski, Juliette, Anthony Damico, and Tricia Neuman. “Medicare Part D in 2018: The Latest on Enrollment, Premiums, and Cost Sharing.” Kaiser Family Foundation, 17 May 2018, www.kff.org/medicare/issue-brief/medicare-part-d-in-2018-the-latest-on-enrollment-premiums-and-cost-sharing/. Accessed 18 Nov. 2018. United States, Congress, Medicaid and CHIP Payment and Access Commission “Medicare Savings Programs: New Estimates Continue to Show Many Eligible Individuals Not Enrolled.” Aug. 2017, www.macpac.gov/publication/medicare-savings-programs-new-estimates-continue-to-show-many-eligible-individuals-not-enrolled/. Accessed 18 Nov. 2018. Collins, Sara R., Munira Z. Gunja, and Michelle Doty. “How Well Does Insurance Coverage Protect Consumers from Health Care Costs?” Commonwealth Fund, Oct. 2017, https://www.commonwealthfund.org/publications/issue-briefs/2017/oct/how-well-does-insurance-coverage-protect-consumers-health-care. Accessed 24 Oct. 2018. Brooks, Tricia et al, “Medicaid and CHIP Eligibility Enrollment, Renewal, and Cost Sharing Policies as of January 2018: Findings from a 50-State Survey.” Kaiser Family Foundation, 21 Mar. 2018, https://www.kff.org/medicaid/report/medicaid-and-chip-eligibility-enrollment-renewal-and-cost-sharing-policies-as-of-january-2018-findings-from-a-50-state-survey/. Accessed 18 Nov. 2018. Broaddus, Matt and Leighton Ku. “Out-of-Pocket Medical Expenses for Medicaid Beneficiaries Are Substantial and Growing.” Center on Budget and Policy Priorities, 31 May 2005, www.cbpp.org/research/out-of-pocket-medical-expenses-for-medicaid-beneficiaries-are-substantial-and-growing. Accessed 28 Nov. 2018.